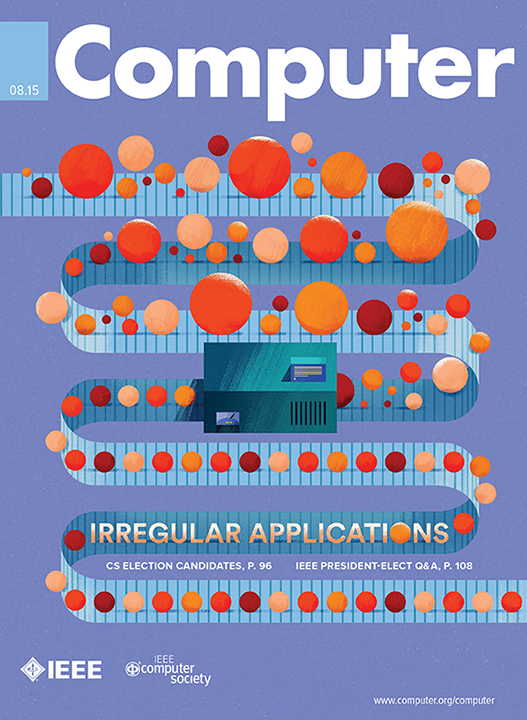 The August 2015 issue of Computer with its focus on “Irregular Applications” owes its editorial direction to two special guest editors: Antonino Tumeo, of Pacific Northwest National Laboratory’s Advanced Computing, Mathematics, and Data Division High Performance Computing group, and John Feo, who recently rejoined PNNL as the new co-director of the Northwest Institute for Advanced Computing, a joint collaborative center founded jointly by PNNL and the University of Washington. In the issue, Tumeo and Feo take a holistic look at irregular behaviors in computing systems at all layers of the software and hardware stack. Irregular applications span a broad range of unpredictable, complex behaviors in data structures, control, and communication patterns. All of these, combined with the exponential growth in data availability, pose performance problems for high-performance computing systems typically optimized for scientific simulations and, thus, for regular and predictable behaviors. Tumeo and Feo also use the issue to promote the idea that only deep collaboration between computing and data scientists and engineers will enable the design capacity to provide solutions for supporting efficient execution of irregular applications. Among the four articles included in their examination of irregular applications, “Codesign Lessons Learned from Implementing Graph Matching on Multithreaded Architectures” centers on irregular workloads from a classical graph problem and features lead author Mahantesh Halappanavar, the Data Analytics Team Lead with ACMD Division’s Data Sciences group. The article describes how Halappanavar and his colleagues employ two variants of the graph matching problem, several algorithms, and implementations on diverse HPC platforms to manage the unpredictable workloads and data presented by irregular application performance. In the article, they summarize their (sometimes counterintuitive) “lessons learned” implementing these applications on parallel architectures. The variety of algorithms and breadth of hardware platforms support the applicability of their lessons to a broad class of graph algorithms (irregular applications) on emerging and future multithreaded architectures that will help other researchers. Computer is the IEEE Computer Society’s flagship magazine that covers all aspects of computer science and engineering. Halappanavar M, A Pothen, A Azad, F Manne, J Langguth, and A Khan. 2015. “Codesign Lessons Learned from Implementing Graph Matching on Multithreaded Architectures.” Computer 48(8):46-55. DOI: 10.1109/MC.2015.215. Tumeo A and J Feo. 2015. “Irregular Applications: From Architectures to Algorithms [Guest editors’ introduction].” Computer 48(8):14-16. DOI: 10.1109/MC.2015.233.